I am so out of it. I've been awake since 4 this morning and have somehow stumbled through the day with the single goal of not going to sleep again until a normal-ish bedtime. Mucho thanks to the co-workers who welcomed me back with open arms only to see me stagger out at noon. So I spent some time, as I was able to concentrate on anything, watching bits of my new DVD. I played with some of the extra features and made it through "24 x 7 I Think of You," which, by the way, I love way more than I should, and the picturization makes me love it even more, and I've learned a few of the moves, so look out. Anyway, here are my thoughts on what I've seen so far. Largely because of "24 x 7 I Think of You" but admittedly also because of the shenanigans leading up to it, Shahid Kapoor is growing on me. And I am enjoying Kareena so far too - no screeching (yet). And they've made her look normal, which helps a lot. There's a little segment of that song when they're dressed as royalty that she is just stunning - that girl can rock heavy eyeliner like nobody's business. I bought this DVD at an honest-to-goodness movie store, not some random guy on the street, and the box is all fancy with frippery inserts and cutouts (that's for you, Keith), but I'm still worried that I bought a pirated or otherwise not-up-to-snuff copy because the music is off from the visuals in the songs. This always drives me crazy - not as much as subtitle lag, but still. How would I figure out which company released the official version? Or is there even such a thing? V confusing. Error alert! When Kareena first discovers the baby, the newspaper she's reading has a headline that says "2-year-old baby missing," but when she reads it out loud, the subtitles say "1-year-old baby missing." I rewound several times and cannot tell what she actually says. The actor who plays the servant Lobo scares the beejeezus out of me. He is one of the strangest looking people I have ever seen. Tanaaz Currim! Tanaaz Currim! With the unfortunate luck of being married to Johny Lever, but still! Yay! Various Upen Patel-related thoughts: 1) did he do his own speaking? Because the voice coming out of him does not sound like I remember him on the BBC Film Cafe interview, but I could have forgotten. It sounds like early SRK to me, the higher-pitched, wavery SRK, remember that? 2) can he dance? Clearly he can pose, but I'm not sure how good he is at the getting from one pose to the next. 3) This isn't relevant to anything, but I know someone's going to ask me why I didn't rave about his fine self, so I will just say I do not find him fine at all, I find him frightening - which I know will come as a great relief to all the men out there who are less muscley than Upen Patel who were wondering how I felt about such matters. line starts at the bottom of the steps. Bring coffee. That first song has some bad costumes in it. Actually, just one that sticks out, but it sticks waaaay out: the tight black tops with giant red dot and then giant red pants with giant yin yan on the left leg. Does anyone else want to call them palazzo pants? I'm not really sure of the exact definition of palazzo pants but these seem like they might do. As you can tell by my repeated use of the word "giant," this ensemble assaults my sense of scale and proporiton. Also, one of the male dancers in the front has his giant pants a little low, so we can see that the black top is in fact a leotard, giving us a flash of hip under the leg hole of the black thing. Choice. But I'm glad men are now getting equal opportunity to show off their back- and side-bacon due to low-ride pants. Not that the dancer had any bacon. And yes, I will do some screen shots, but I'm waiting to get to the part where Akshaye is. Shahid's "showreel" song is crap, right? Both the music and the picturization? But it's supposed to be, right? He's supposed to be a starry-eyed overenthusiastic wannabe who has a ridiculous tape, right? More to come. Now to sleep. 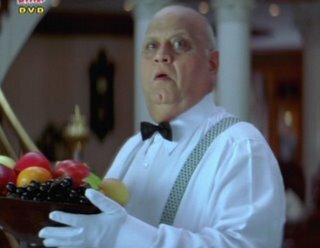 is played by Dinyar Contractor, who was in Baadshah, among a few other things I've seen. imdb doesn't list him for this movie, which is odd, given the givens. Also, we need a picture of the scary servant, please! Yes, Upen actually has been dubbed. I really liked this movie, althought I didn't expect so.Even Kareena(who I don't really like) was nice.Shahid was sweet, as always.